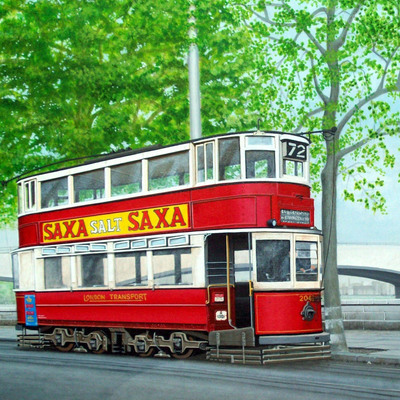 Detailed Acrylic work of historical transport scenes. Also pet portraits in pencil, quality crayonï¿½and acrylic. 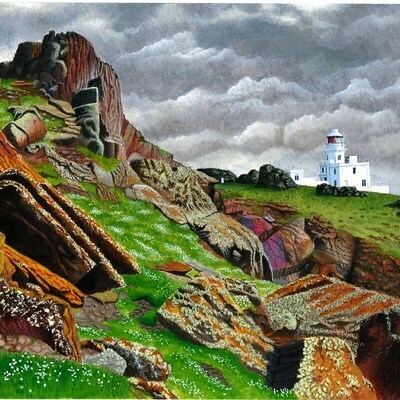 I have been painting now for many years and my style and preferred subject are apparent from the paintings you can see on this web page, but the images that you see do not tell the whole story. Some of the subjects are perhaps a little more obscure than others but each painting has a story to it and, most probably, a reason why I chose to paint it and it is this information that is usually responsible for the commissions that I am asked to paint. I have tried many different mediums but chose to settle with Acrylics as they work in the manner most effective for my technique. I still use pencils, crayons and sometimes ink line work where I feel the subject would be rendered better by their use. The paintings often require a great deal of technical construction in the initial drawing stage as the subjects are usually of a very technical origin and failure to get it right at this stage could result in a very visible error. 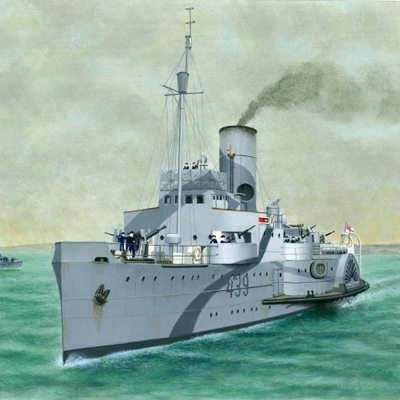 It is at this stage that most of the research for the picture is done and carries on during the time the painting is underway, some subjects being a lot easier than others. However, although the technical side is very important, I still aim to produce a true piece of artwork, the finished result must be first a work of art then a technical rendition. The pet portraits are for me always a joy to do as they are generally pure painting, drawn and painted straight from the picture to the board with only the minimal amount of construction used to get the proportions correct. I love animals and find great pleasure in the painting of them. I find inspiration from many other styles and types of work and appreciate them all. I am aware that the work I do is directed at a certain audience and is not too all tastes but it is what I feel I can do best so continue to develop and improve it. I hope you enjoy looking at this small selection of my paintings. Recently I have been asked to undertake some more unusual paintings, one of which is already with its new owner. 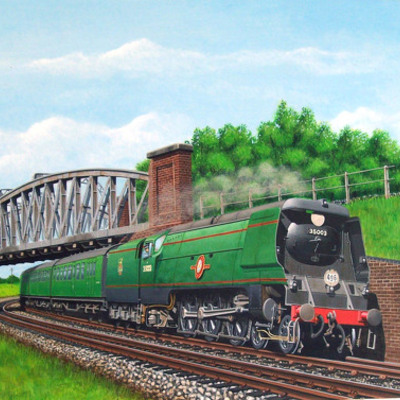 They are two commisions consisting of creating a painting of a scene on the person's model railway, both the persons in question are exceptionally talented modelers. The research has been just as complicated and many photographs of the railway layouts were required.The one that has just been completed was very well received by its owner, the person who built the layout depicted. Fortunately I was able to access his own research photos, the one's he used to construct the buildings on the layout, which I have depicted in the painting. I have completed both of these paintings now, both works being a most enjoyable exercise. They are both now visible in my gallery, Railway and Tramway subjects and I hope they do justice to the technical and artistic skill of the modellers who created the subjects. I am working on subjects that will form a commemoration display of work remembering 100 years since the start of the First World War. Though that time is remembered for the tragic loss of life and awful conditions these men had to live in, research shows there there was a lot of periods of inaction and tedium and I am trying to shew that in some of the pictures I plan to complete over the next few months. I have now added the first of these, the B Type Bus, into the gallery so please take a look. My latest work continues this theme and is of a Rolls Royce Armoured Car in use on the Western Front. In this painting I have begun refining a new technique to achieve a smoother and finer finish. Please take a look. Continuing this technique, I have applied it to the Accrington Steam Tram. After much research I discovered that as yet no record of the colours used by Accrington Corporation Steam Tramway has been discovered, this painting is a best guess assisted by a contemporary hand coloured postcard, but it makes an attractive painting. Recently I was requested by ASPIRE magazine (an arts and lifestyle magazine published throughout the midlands area) to advertise my work as part of a promotion for arts and crafts on the Isle of Wight and was very pleased with the small article they did about my work. They then included an interview with me in the next issue and I was greatly honoured when they presented me with an award for the Detail Artist of the year 2014 finishing with a third article about the award and my work. It is a wonderfull recognition of my painting. I continue to work and have completed some more commissions which I have now added to my galleries. One which is a little unusual for me, is a landscape of a wildlife reserve Island off of Wales. The colours seem rather strange but are accurate, the customer who requested it has a great interest in geology and also the study of lichen. As it could not be entered under any of the title galleries I have, there is now an additional gallery. I have also added another railway scene to my galleries, this time of an early Spanish locomotive that was built in this country. There seems to be an increase of interest in the Trolleybusses that worked in this country until 1972 (Bradford was the last to use them and, strangely the first). I have now completed a Portsmouth scene and a Bournemouth scene and I have been asked to do a London scene, which is now completed, please take a look, I hope you enjoy them.